This map shows the area covered by a new University of Utah study that concludes a population boom and resulting scarcity of wild foods are what caused early people in eastern North America to domesticate wild food plants for the first time on the continent starting about 5,000 year ago. The triangles and names represent archaeological sites previously identified as locations where one or more of the these plants first were domesticated: squash, sunflower, marshelder and pitseed goosefoot, a relative of quinoa. The small circles are sites where radiocarbon-dated artifacts have been found, with a single circle often representing many dated artifacts. The study area includes much of eastern North America inland from the Atlantic and Gulf coasts. Credit: Elic Weitzel, University of Utah. "Domesticated plants and animals are part of our everyday lives, so much so that we take them for granted," says Brian Codding, senior author of the study published online August 2 by the British journal Royal Society Open Science. "But they represent a very unique thing in human history. They allowed for large numbers of people to live in one place. That ultimately set the stage for the emergence of civilization." Graduate student Elic Weitzel, the study's first author, adds: "For most of human history, people lived off wild foods - whatever they could hunt or gather. It's only relatively recently that people made this switch to a very different method of acquiring their food. It's important to understand why that transition happened." The study dealt not with a full-fledged agricultural economy, but with the earlier step of domestication, when early people in eastern North America first started growing plants they had harvested in the wild, namely, squash, sunflower, marshelder and a chenopod named pitseed goosefoot, a pseudocereal grain closely related to quinoa. Codding, an assistant professor of anthropology, says at least 11 plant domestication events have been identified in world history, starting with wheat about 11,500 years ago in the Middle East. The eastern North American plant domestication event, which began around 5,000 years ago, was the ninth of those 11 events and came after a population boom 6,900 to 5,200 years ago, he adds. For many years, two competing theories have sought to explain the cause of plant domestication in eastern North America: First, population growth and resulting food scarcity prompted people to grow foods on which they already foraged. Second, a theory called "niche construction" or "ecosystem engineering" that basically says intentional experimentation and management during times of plenty - and not immediate necessity - led people to manage and manipulate wild plants to increase their food supply. "We argue that human populations significantly increased prior to plant domestication in eastern North America, suggesting that people are driven to domestication when populations outstrip the supply of wild foods," Weitzel says. "The transition to domesticating food allowed human populations to increase drastically around the world and made our modern way of life possible," he adds. "People start living near the fields. Whenever you've got sedentary communities, they start to expand. Villages expand into cities. Once you have that, you have all sorts of social changes. We really don't see state-level society until domestication occurs." The region of eastern North America covered by the study includes most of Missouri, Illinois, Indiana, Ohio, West Virginia, Kentucky, Tennessee and Arkansas, and portions of Oklahoma, Kansas, Iowa, Virginia, North Carolina, South Carolina, Georgia, Mississippi and Louisiana. "This is the region where these plant foods were domesticated from their wild variants," Weitzel says. "Everywhere else in North America, crops were imported from elsewhere," particularly Mexico and Central America. Four indigenous plant species constitute what scientists call the Eastern Agricultural Complex, which people began to domesticate about 5,000 years ago. Previous research shows specific domestication dates were 5,025 years ago for squash at an archaeological site named Phillips Spring in Missouri, 4,840 years ago for sunflower seeds domesticated at Hayes in Tennessee, 4,400 years ago for marshelder at the Napoleon Hollow site in Illinois, and 3,800 years ago for pitseed goosefoot found in large quantities at Riverton, Illinois, along with squash, sunflower and marshelder. 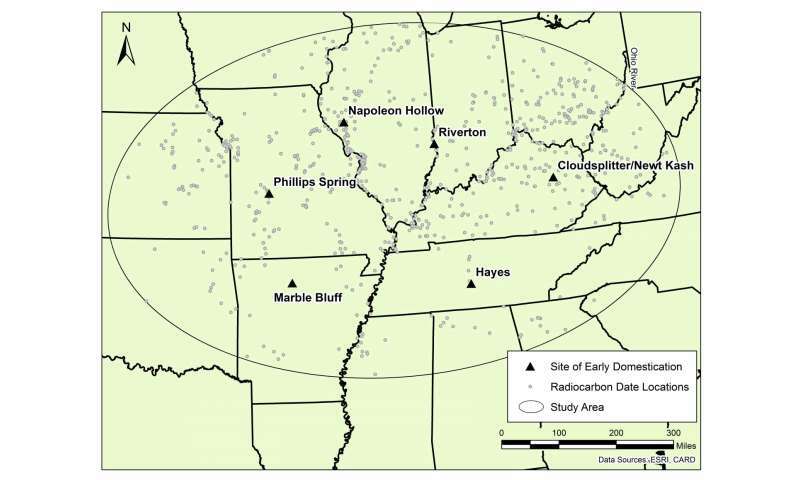 Three more recent sites also have been found to contain evidence of domestication of all four species: Kentucky's Cloudsplitter and Newt Kindigenash rockshelters, dated to 3,700 and 3,640 years ago, respectively, and the 3,400-year-old Marble Bluff site in Arkansas. Sunflower and squash - including acorn and green and yellow summer squashes - remain important crops today, while marshelder and pitseed goosefoot are not (although the related quinoa is popular). "It's really difficult to arrive at measures of prehistoric populations. So archaeologists have struggled for a long time coming up with some way of quantifying population levels when we don't have historical records," Weitzel says. "People have looked at the number of sites through time, the number of artifacts through time and some of the best work has looked at the effects of population growth," such as in the switch from a diet of tortoises to rabbits as population grew in the eastern Mediterranean during the past 50,000 years, he adds. Codding says that in the past decade, archaeologists have expanded the use of radiocarbon-dates for artifacts to reconstruct prehistoric population histories. Weitzel says radiocarbon dates in the new study came from artifacts such as charcoal, nutshells and animal bones - all recorded in a database maintained by Canadian scientists. The University of Utah anthropologists used these "summed radiocarbon dates" for 3,750 dated artifacts from eastern North America during the past 15,000 years. "The assumption is that if you had more people, they left more stuff around that could be dated," Weitzel says. "So if you have more people, you conceivably should have more radiocarbon dates." "We plotted the dates through time," namely, the number of radiocarbon dates from artifacts in every 100-year period for the past 15,000 years, he adds. The analysis indicated six periods of significant population increase or decrease during that time, including one during which population nearly doubled in eastern North America starting about 6,900 years ago and continuing apace until 5,200 years ago - not long before plant domestication began, Codding says. Codding notes that even though plant domestication meant "these people were producing food to feed themselves and their families, they're still hunting and foraging," eating turtles, fish, water fowl and deer, among other animals. Weitzel says the concept of niche construction is that people were harvesting wild plants, and "were able to get more food from certain plants." By manipulating the environment - such as transplanting wild plants or setting fires to create areas favorable for growth of wild food plants - they began "experimenting with these plants to see if they could grow them to be bigger or easier to collect and consume," he adds. "That kind of experimentation then leads to domestication." Codding says: "The idea is that when times are good and people have plenty of food then they will experiment with plants. We say that doesn't provide an explanation for plant domestication in eastern North America." He believes the behavioral ecology explanation: increasing population and-or decreasing wild food resources led to plant domestication. Well the most commonly cited hypothesis regarding why farming was developed in the Middle East during the "Neolithic Revolution" involves climate change to more arid after the ice age ended, causing the population to concentrate around major rivers. Overpopulation triggered agriculture out of necessity, since people couldn't survive simply by gathering crops that grew naturally. Didn't Johnny Appleseed have something to do with this? Appleseed was amongst one of the later waves, but did make a change in the country that was seen for nearly 150 to 200 years, and that was the normality of people growing and using apples in their own yards/farms as a necessity. Now folks are too worried about pollution or spraying to eat their own fruit and buy stuff at the stores that while may Look nicer, can be GUARANTEED to have the sprays and pesticides. I wonder if food domestication is close to the time that they hunted off the largest of the land mammals, leading to Needing an enlarged food source.